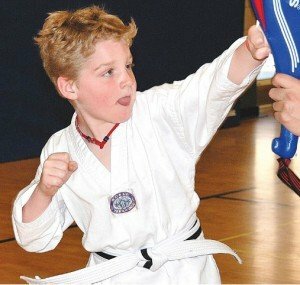 Second-grader Christopher Carreras practices hand combination punching during the April 15 session of Martial Arts, an after-school program offered by Southborough Recreation at Woodward Elementary School. PHOTO/EDKARVOSKIJR. Southborough – Second-grader Christopher Carreras practices hand combination punching during the April 15 session of Martial Arts, an after-school program offered by Southborough Recreation at Woodward Elementary School. Throughout the six-week course, students in grades two and three learned the basics of the sport from professional martial arts instructor Viet Bguyen.